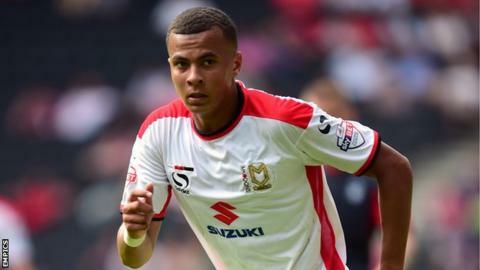 Teenager Dele Alli scored a hat-trick as MK Dons overwhelmed Crewe. The 18-year-old slotted home from close range inside three minutes before Crewe were gifted a leveller thanks to a Kyle McFadzean own goal. Will Grigg poked home to restore the home side's lead before Alli headed in a third from Ben Reeves' cross. Benik Afobe's then netted after a long ball from Alli, who completed his hat-trick before Reeves curled an effort past goalkeeper Ben Garratt. Alli - who extended his contract until 2017 this week - was named Football League's Young Player of the Month for August. "We were very, very good. We worked off our shape very well out of possession. We're a team that's always on the front foot, and always trying to dominate on the front foot. I think today we did it so much better. "We've now got to go to the league leaders next Saturday. The league table looks wonderful for seven days. "The chairman said Dele Alli gave the best individual performance he's seen at the club. He does all the talking with a football, I don't have to talk about him. The fans have got a local hero to be very proud of." "When we have a performance like that I hurt just like a supporter. It was shameful at times. None of them have come out of the game with any credit. "We were so second best at times it was frightening. We spent most of the game fire fighting. When we were putting out one problem another one arose. It showed that some of our players are struggling with this league. We didn't show any ability on the ball or without the ball." Match ends, MK Dons 6, Crewe Alexandra 1. Second Half ends, MK Dons 6, Crewe Alexandra 1. Corner, Crewe Alexandra. Conceded by Kyle McFadzean. Attempt saved. Daniel Powell (MK Dons) left footed shot from the centre of the box is saved in the centre of the goal. Foul by Tom Hitchcock (MK Dons). Febian Brandy (Crewe Alexandra) wins a free kick in the attacking half. Goal! MK Dons 6, Crewe Alexandra 1. Ben Reeves (MK Dons) left footed shot from the centre of the box to the top left corner. Assisted by Benik Afobe. Corner, Crewe Alexandra. Conceded by Dean Lewington. Goal! MK Dons 5, Crewe Alexandra 1. Dele Alli (MK Dons) right footed shot from the centre of the box to the top left corner. Assisted by Tom Hitchcock. Attempt missed. Febian Brandy (Crewe Alexandra) right footed shot from outside the box misses to the right. Substitution, MK Dons. Tom Hitchcock replaces Dean Bowditch. Substitution, Crewe Alexandra. George Cooper replaces Vadaine Oliver. Attempt missed. Ben Reeves (MK Dons) right footed shot from the left side of the box is close, but misses the top left corner. Attempt saved. Kyle McFadzean (MK Dons) right footed shot from outside the box is saved in the top left corner. Hand ball by Vadaine Oliver (Crewe Alexandra). Substitution, MK Dons. Jordan Spence replaces George Baldock. Goal! MK Dons 4, Crewe Alexandra 1. Benik Afobe (MK Dons) right footed shot from the centre of the box to the top left corner. Assisted by Dele Alli. Attempt saved. Thierry Audel (Crewe Alexandra) right footed shot from the centre of the box is saved in the top centre of the goal. Attempt saved. Dean Bowditch (MK Dons) left footed shot from the right side of the box is saved in the top left corner. Corner, MK Dons. Conceded by Jon Guthrie. Corner, Crewe Alexandra. Conceded by David Martin. Attempt saved. Febian Brandy (Crewe Alexandra) right footed shot from outside the box is saved in the top left corner. Attempt missed. Antony Kay (MK Dons) header from very close range is too high. Corner, MK Dons. Conceded by George Ray. Corner, MK Dons. Conceded by Matt Tootle. Substitution, Crewe Alexandra. Febian Brandy replaces Billy Waters. Substitution, Crewe Alexandra. Oliver Turton replaces Jamie Ness. Daniel Powell (MK Dons) wins a free kick on the right wing. Attempt missed. Dean Bowditch (MK Dons) right footed shot from the right side of the six yard box is close, but misses to the right. George Ray (Crewe Alexandra) is shown the yellow card. William Grigg (MK Dons) wins a free kick in the defensive half. The next Gerrard ready for lift-off?